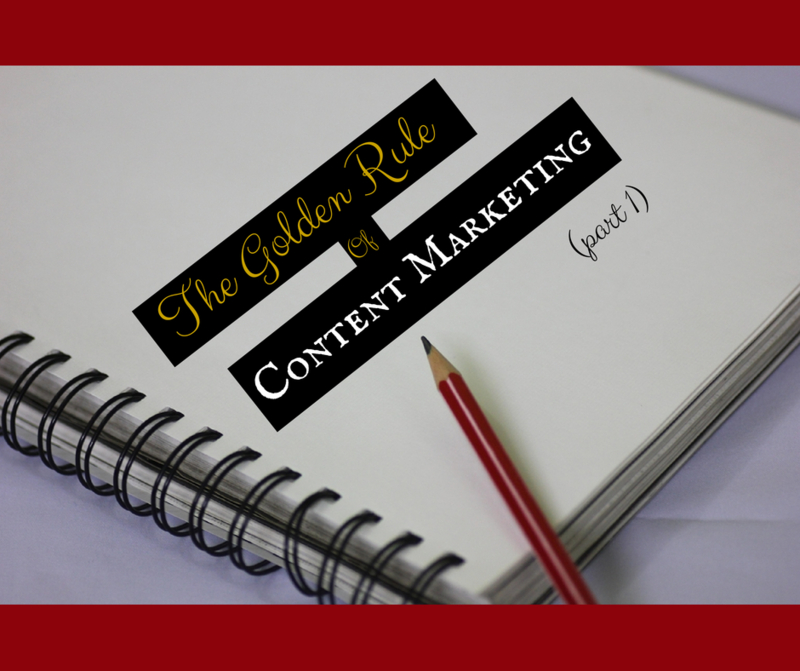 The Golden Rule of Content Marketing: post informative and educational content 70% of the time, ask for the sale 20% of the time, and add personal flair 10% of the time. 70/20/10. The 20%, or rather the self-promotion percentage, is the easier part of content marketing; this includes: promoting sales, marketing new product releases, releasing product reviews, and anything else relating to your products and/or services. This is a crucial aspect of your content marketing and digital marketing, alike. However, it only covers 20% of your content. Why is this? Well, promoting your brand is important, but if you dedicate every post on social media to self-supporting commentary the likelihood of your customers turning their backs on your brand is extremely high. We all know someone who shamelessly promotes themselves every chance they get; let’s call this person Sally. Sally can turn every conversation into how great she is, how exciting her life is, or simply how much better she is at everything. Sally may have been your friend at some point, but it’s likely you have distanced yourself to avoid constant irritation. Replace Sally with your business, and you have the same irritation, just in a grander scheme. As of late, there are 3B Internet users in the world. Half of the world population uses the Internet in some way or another. Of the 3B Internet users, 1.28B use Facebook, 271M use Twitter, 200M use Instagram, and 70M use Pinterest. The most shocking fact, however, is that these numbers are on the rise not the decline. Social media is the future. When social media took hold of consumers’ interest, corporate marketers jumped on the bandwagon and started engaging with their customers and their potential customers online! What they have realized over the past couple of years is that these social media users do not want to speak with the CEO of the business in a formal, prim-and-proper manner; they want to engage with these brands as if they were speaking with a close friend. H2H. Human to Human. This is what digital marketing has become, and this is what online consumers want to receive from their favorite brands. No longer does the consumer want to hear from Sally, they want to hear from their ‘everyday Joe’ or the girl next door. Consumers want to say: ‘I was retweeted by Coca Cola today; they replied to me saying that they are ecstatic I enjoyed their new cans.’ The online user wants you to be accessible, and they want to know that you care about more than simply selling product. When you follow the 70-20-10 rule, you are establishing trust with potential customers and cultivating a long-lasting relationships with your current customers. For this post, I am going to focus on the larger 70% of the Golden Rule of Content Marketing, or rather, the ‘educational and informative’ content that you should be posting on a daily basis. This is also known as curated content or content we source from industry-related businesses, blogs, YouTubers, industry experts, and more. What is the process for curating content? How do I know what types of articles to search for? Where do I find content worthy of curation? These are the questions I will answer for you in this 5-step guide to content curation. Before you start sifting through blogs, vlogs, tweets, pins, whatever, you need to know your company’s keywords. Keywords are crucial for not only digital marketing and content curation, but also for your overall business direction. However, this ‘keyword database’ is going to be used specifically for curating content. Preferably your marketing plan, business plan, or if you do not have access to these documents, just a competitor analysis. Gather your marketing team into a spare office or travel to your nearest coffee shop. Bring your whiteboard, whiteboard markers, a laptop, and the documents I mentioned in number 5. Tell your team the purpose of this brainstorming session and get to work! Use the whiteboard to visualize your ideas and encourage group participation, while using the Internet and your strategic documents to guide the discussion. What are our business values? What are the popular industry keywords? What is our targeted audience posting about? What does our targeted audience want to hear? What are a few keywords related to our product/service? Try to create a list of 5-10 keywords, and use this list to help you through the rest of these steps. When I first started out in the digital marketing field, 6 years ago, I spent hours sifting through content trying to find articles that related to my established keyword database. The result: many hours wasted and very few articles curated. One of the most helpful tools I found last year is BuzzSumo, a content curation site that does most of the work for you! BuzzSumo has significantly decreased my workload; I highly suggest that you create a profile and explore the site. You know those keywords we just made? This is where you use them! Never again will you have to sift through awful articles on pages 2-100 on Google to find articles worthy of posting to your social media platforms. When reading through the headlines featured on your BuzzSumo search, it is guaranteed that you will run into some fantastic blogs. Make sure that you bookmark these websites, so that you may use them for future reference. It will significantly decrease your long-term workload if you log these websites and blog URLs onto a document, or you utilize your ‘bookmarks’ tab to store each of your favorite websites. 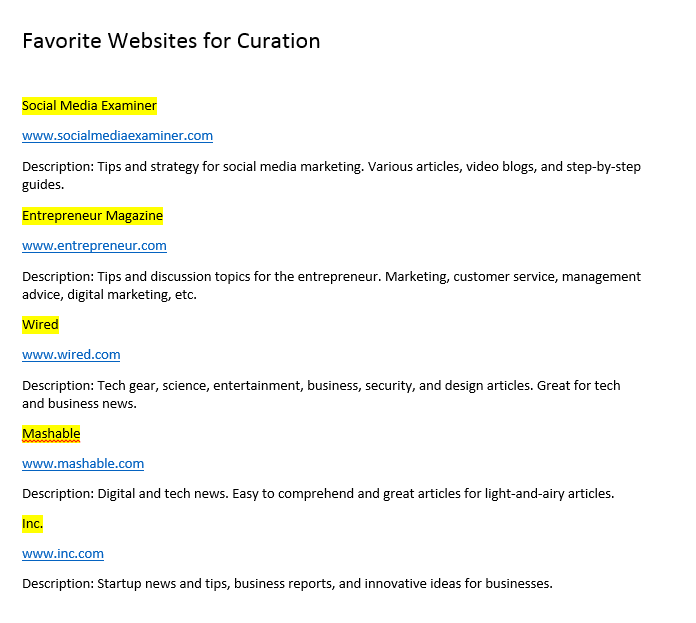 Although BuzzSumo has everything you could possibly need to find great articles for posting to your social media platforms, there are a myriad of other ways to curate great content. Some of which include directly using your social media profiles. 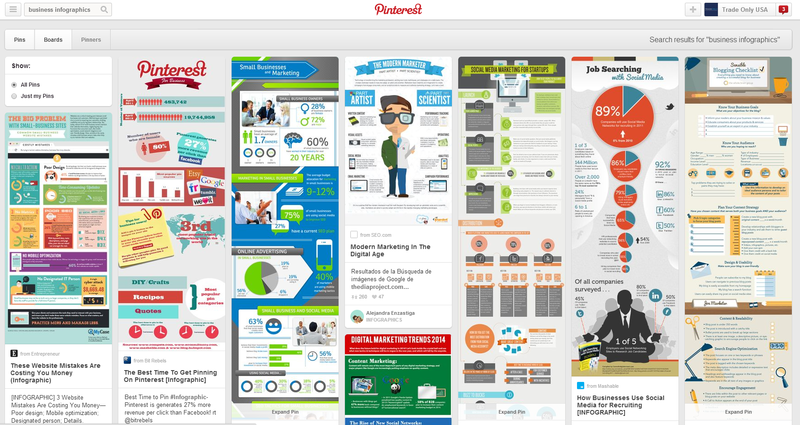 To find great infographics to share with your audience,Pinterest and Google+ are the best choice. Using Google+: The most helpful social media feature I have ever encountered is the ‘community’ feature of Google+. Google+ communities are a great way to find topical content to suit your interests; you can also kickstart discussions, and request for feedback from various group members. Unlike Facebook, Google+ communities are more information-based and a great source for excellent content. All you have to do is type your keywords into the ‘search’ bar and simply join any communities that tickle your fancy. LinkedIn and Facebook (as I have mentioned) also have a ‘group’ section, in which you can participate in discussions regarding your industry. This inadvertently promotes your business, while exemplifying your desire to engage with your audience regarding any questions or comments they may have. When using social media to curate content, it is crucial that you engage with others’ posts: comment, ‘like’, share, etc. When you engage with other businesses, you create a community. When you have a strong social media community, your online business will flourish. As I have mentioned in many of my blog posts, I believe that time spent learning is never time wasted. While you are curating content, it may behoove you to take notes on important information. When I’m reading through digital marketing, small business, and general marketing articles, you often find me with a pen in hand ferociously taking notes. I count this time as not only ‘curation time’ but also ‘learning time’ that will help me to become more knowledgeable in my field.